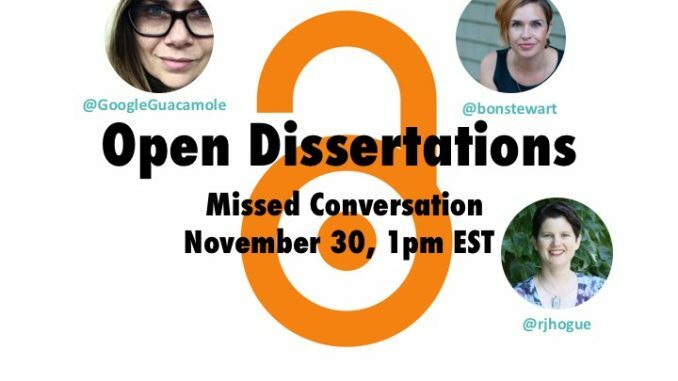 On Wednesday November 30 at 1pm Eastern, we will be holding a missed conversation about open dissertations. At the #openEd16 conference, Bonnie Stewart and Laura Gogia were on a panel that talked about open dissertations. The intent of this session is to continue the conversation on the topic. Bonnie, Laura, and Rebecca have blogged on the topic. If you are interested in the topic, we encourage you to blog and leave a comment. In addition, we have a couple of spaces available if you want to join the discussion (preference given to students who have not yet defended their thesis/dissertations). If you are interested in joining the conversation, please tweet us (@vconnecting) or email info@virtuallyconnecting.org. There are only a couple of spots, and it is filling fast. Please do not sign up unless you are certain you can attend. The session will be live broadcast, recorded, and live tweeted. Questions can be posed through Twitter during the session.